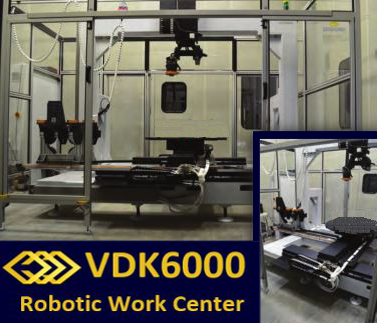 VDK6000 Robotic Work Center from Flexible Robotic Environment (FRE) offers advanced manufacturing systems with integrated subtractive manufacturing, additive manufacturing and in-process inspection. This robotic work center automates almost “any process” for components you can dream up with very high accuracies or even just print new ones. The unit allows you to clamp the part once and perform a multitude of operations, so the idea is once a part is held to perform all operations including inspection. This system offers a “True 3D Synchronous Motion Control” with Aerotech motion. All parameters listed below are process dependent and may be modified to your requirements. Take a look below at what may be included with your Robotic Work Center. System is standard with 6 DOF but may be configured with additional redundant axis. Fully Guarded and interlocked per robotic standards. Ease of access design and may have additional automated loading added. MoDusCAM™ – SolidWorks robotic path planning application with 3D graphical interface. Click here for all our Product informational files. Check out our YouTube videos with this link.